The Little Barn01263 715779work01603 870304fax Self-cateringAn attractive barn, that was once part of the Felbrigg Estate, which is arranged in a L-shape around a pretty, private garden. Situated in Sustead you can experience the peace and quiet of the rural countryside whilst the North Norfolk Coast is only a short drive away. An ideal location for cyclists and walkers, this is the perfect place for a family or friends' gathering with plenty of room for guests to relax in. • Outdoors: Enclosed garden with lawn and patio with table and chairs. An attractive barn, that was once part of the Felbrigg Estate, which is arranged in a L-shape around a pretty, private garden. 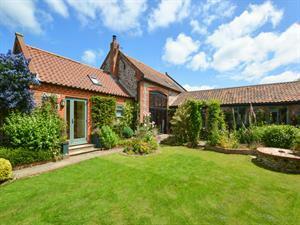 Situated in Sustead you can experience the peace and quiet of the rural countryside whilst the North Norfolk Coast is only a short drive away. An ideal location for cyclists and walkers, this is the perfect place for a family or friends' gathering with plenty of room for guests to relax in.